Here’s another new number plate series for those wanting to stand out. The ‘U’ series – U 1 to U 9999 – also allows for a short number plate with only one alphabet. The numbers were open for bidding last week, and the end of the tender period is September 8. Results will be out on September 18. 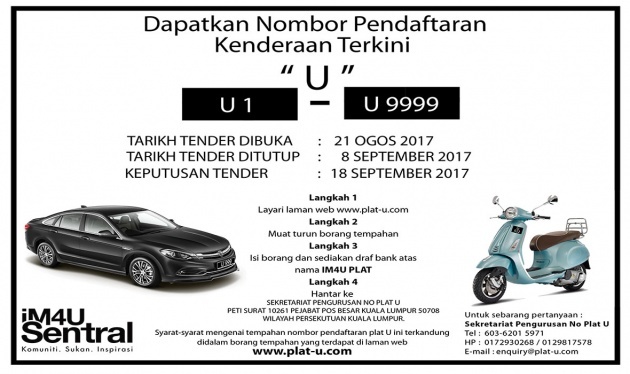 The series is being auctioned by “iM4U Sentral” which could mean that it’s the same people behind the previous 1M4U plate series. Interested parties can make reservations from as low as RM50, but of course, plates go to the highest bidders. Conversely, there are no maximum prices, and bids can go as high as the demand a particular number attracts. Lately, there have been many chasing the ‘8055’ number to tell the world that they are the boss, as seen with ‘AKU 8055’, but I wonder if “U 8055” would be half as popular. Fans of U2 might want to show their devotion via a number plate, while angry types could print out their constant Cantonese cursing on a number plate – U 114, U 967 and so on. Good luck! A, B, C and U are letters in the Alphabet. So, U is a single letter. Oh Selamatkan Malaysia. Malaysia kembali gemilang. Where is Langkawi, the land where people likes to buy vehicles for good reasons?! Apa pon mau jual lol. For a gud cause, why not? Sukan negara. We want to aim for 130 gold next SEA games. Is that not a gud cause? Only certain pipu wanna belip what they wanna belip. U prefer they increase car taxes instead, no? We prefer Gov abolish tax. U also untung ma. If abolish tax where got money to fund development? Which significant country runs successfully w/o taxes? Which low corruption country that does not tax its citizen, please share. Our country has MULTIPLE taxation. Most developed countries only have one or two. With other developed and responsible countries what they pay in taxes is clearly evident in their infrastructure. Jalan takde lubang, walkways all smooth without metal pieces sticking out, nice bus stops, efficient public transport etc etc. Everything is well maintained. What about us? We still need money from China and at same time they TAX the heck out of every msian citizen. Remember MULTIPLE taxation points. We are paying for it and government is now selling number plates?! Election time you guys know what to do lah.. MOST countries has multiple taxation. Some even more complex and mind boggling than us. Try doing personal income tax in USA. U wun succeed to file it properly w/o a tax consultant, and if u file it improperly, hefty fine awaits u. Remember that majority countries has GST/VAT and none of them have the level of ZERO rated and multitudes exemption for economic benefits & poor pipu like we have. GST doesnt affect the poor unless they spend on non-essentials. That doesnt mean a blanket protection for everyone cant & refuse to work. In Britain, they can no longer justify taxing pipu 60% income to feed homeless that refuses to work, and sapot a NHS that verging on bankruptcy. Ours still within a fine balance of sustainability, caring for the poor but not incentivising them to refuse work, althou taxation for upper & middle income is still too low, imho. So guys, during election time think about this logically and know what to do lah..
Funding effort in full swing now. I belip ‘U’ will be next Wilayah plate since we gonna quick run out of ‘V’ plates in another few years. I reckon X & Y will be saved for next Wilayah plate once V has run out. I think UA- onwards is next, just like previous single V is for tender, then VA- onwards is normal Wilayah plate. As long both is happy. U ten ? U turn? Dear all, how to know the result of U plat?? Until now no result coming out..